This week Chick-Fil-A has been doing a special preview of their upcoming Spicy Chicken Sandwich. Fans (or should we call them “likes” now?) on Facebook were encouraged to sign up for special reservation slots at their local Chick-Fil-A’s to check out the new sandwich that officially launches on June 7th. I, of course, signed up JC and I for the Altamonte drive-thru Chick-Fil-A. Yes, if you haven’t been there it is a Chick-Fil-A set up with double drive-thru’s and no dining area. Looks just like a Checkers (or Rally’s depending on where you live). Burger King has some funny commercials with “The King” running around. In their newest commercial “The King” breaks into a competitors headquarters and steals a recipe for use in Burger Kings around the world. Panda Express is launching a new product and there are offering it for FREE tomorrow (March 10th). Click the link and print out the coupon! The new product is Honey Walnut Shrimp and it looks yummy! I’ve never had Honey Walnut Shrimp ever before, not sure I’ve seen it on a Chinese menu before at all. I’ve also never had any shrimp at Panda Express so I can’t vouch for this product being any good at all. 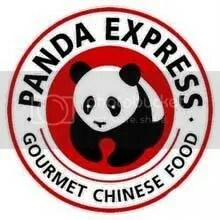 I’ll hopefully be swinging by the Panda tomorrow after work to try it out though! I do enjoy Panda Express’s Beijing Beef and Sweet Fire Chicken which are both additions to the Panda Express menu over recent years. I’m guessing it should be at least worth a trip over there. So, I saw this video on a favorite blog of mine Serious Eats and found it too amazing to pass up. This is a commercial for IHOP (International House of Pancakes) from 1969. Judging by this commercial I would say that IHOP was looking to draw in some customers who may or may not have enjoyed some illicit drugs. “Of course it says pancakes on the outside but there’s a lot more on the inside.” <–Now that is an understatement. Free Chick-Fil-A food today. Check out yesterday’s post. I have joined the masses and gotten myself a twitter. @d0d0joe (those are zero’s, just like the blog addy) is how you will find me. I haven’t updated it a ton, but I am enjoying seeing insight into my sister’s life @fakpij, also following famous folks like the Mythbusters (@donttrythis @grantimahara) and Mike and Mike (@GreenyAndGolic). I’m also loving hearing my mom make wise cracks about my receding hair line @momofkait. So check out my tweets…or not…want me to follow you? Leave me your handle! Cow Appreciation Day is TOMORROW! Tomorrow July 10th is Cow Appreciation Day at Chick-Fil-A! What does this mean to you? Dress up like a cow and you get free meal. Dressing from “head to toe” will get you a full combo for free!!! 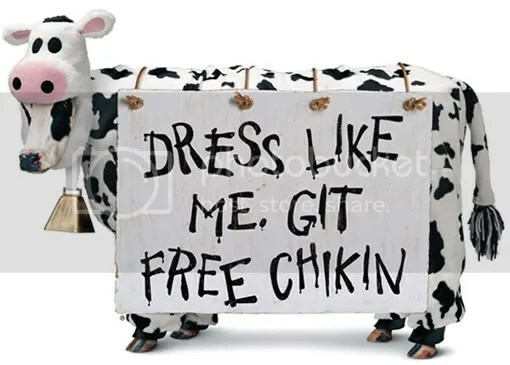 Dressing partially like a cow will get you a free entree! More questions? Check this out. Also, don’t feel like making/buying a cow costume? Print this “starter kit” from Chick-Fil-A. I know that this isn’t brand new, it has just returned. “Back by popular demand” they say is The Six Dollar Thickburger and I decided that since I have a blog, I would write about it. FREE KFC UnFried Chicken TODAY! Remember just the other day I told you about KFC’s new grilled chicken??? Well, now you can go try some! KFC is giving EVERYONE one free piece of the UnFried chicken at their restaraunts NATIONWIDE today!!! Go get some!!! If you have been watching television recently you may have noticed that Kentucky Fried Chicken is doing something different. Grilled chicken. I know that they have had a grilled chicken breast sandwich for about a year, but this is actually buckets of grilled chicken. Grilled chicken breasts, thighs and legs. An interesting thought, but one I’m sure they are doing to try to lure the millions of us trying to be healthy!